This is the latest book in the Marcus Corvinus Mystery Series authored by David Wishart. It is set in Ancient Rome in the first century A.D. I have a review of the first book in the series on this site, too. If you are new to the series, it is a good idea to read the books in order. There are recurring characters, and Corvinus's private life develops over time, and the historical events proceed chronologically, too, naturally. I have a review of the first book in the series, Ovid, on this site, too. Be warned that the series is a joyously vulgar impersonation of a Roman era novel, full of foul asides and mocking of persons in power, just like what appears in Roman era poetry and scraps of novels that remain, not to mention all the graffiti that remains, too! Valerius Marcus Corvinus was a real person, but the author has fictionalized him for the series, and made the man a snoop. 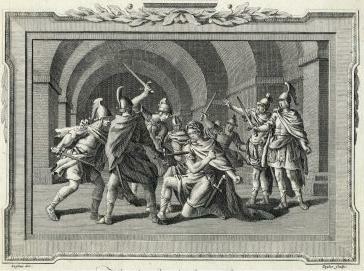 Born into the highest social class of class-conscious ancient Rome, during the Julian-Claudian era of Emperors (1st century A.D.), Corvinus rejects the standard course of career expected of a man of his rank, and instead drinks his way through investigations that often bring him in contact with the ruling families, and the emperor of Rome. Tiberius, Caligula and Claudius make appearances in the series' books so far, and presumably Nero will show his crazy head sooner or later. Corvinus is related to the royals by marriage, and that plays an important part in Finished Business. His slangy descriptions of his dealings with historical figures is always entertaining. The fictional conceit is that we are reading a contemporary account in translation from Latin. ...the guy might be a cold-blooded amoral sadistic killer and a cartload of tiles short of a watertight roof, but there was nothing wrong with his intelligence. 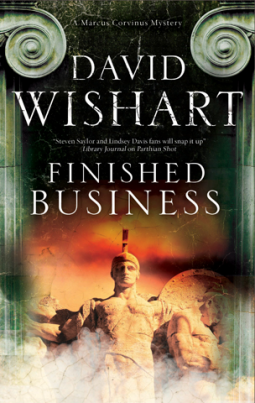 Fans of novels set in Ancient Rome won't be disappointed by Finished Business. We are set right in the middle of daily life in Rome during a time of odd emperors, of territorial protection, and of the administration and maintenance of the vast empire by a large civil service. 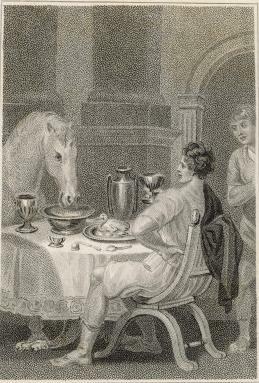 Only one of Caligula's crazy escapades, feeding his horse at the table. The author equates the Roman elitism with British empire-era elitism, which can be disconcerting at times, when he uses British expressions such as "three-namer" and "pukkah-sahib types". 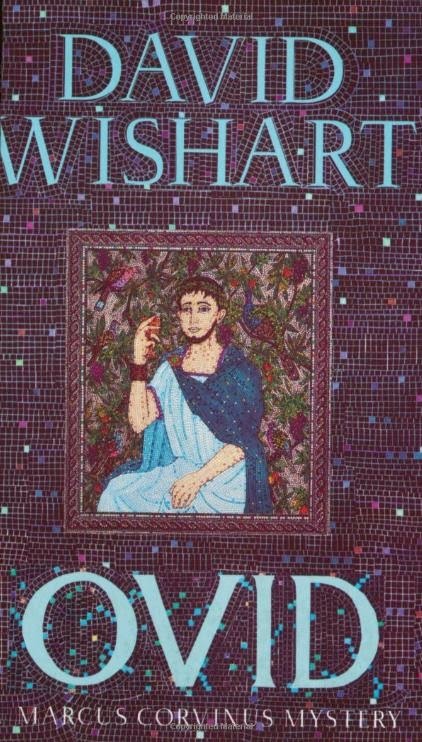 If you have read the Lindsay Davis Falco novels, or some of the Steven Saylor Gordianus novels, you may have a reoccurring sense of déjà vu, just as I have, while reading the David Wishart Corvinus novels. Much of the same historical ground is covered, and many of the same writing tropes are used. Stoic philosophy is mentioned in Finished Business, but it is not explored in much depth, which I regretted. I was also disappointed by the depiction of the relationship between Corvinus and his wife. In the first book, it was much more loving. In Finished Business, the relationship feels more like an excuse for Corvinus to have a sounding board for his theories about the mystery. 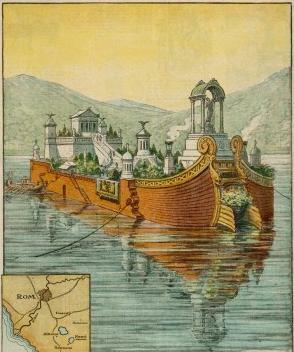 An artist imagining another of Caligula's crazy escapades, a palace on a boat in a lake. This is a mystery, and it follows the standard Private Investigator genre: he gets a case, talks to those involved, forms theories, identifies suspects, investigates, meets opposition and danger, resolves the mystery. The novelty of these books is that the P.I. is roaming the streets of first-century Rome. The author includes many trips for Corvinus through Rome's teaming streets and markets. He even lets him enter shops, homes and various other places, where we tag along and vicariously live in Rome for the duration of the story. The author includes end notes to explain a bit about the actual history of the era covered in Finished Business, and he points out where he took artistic license. There is also an explanation of the Roman times of day and dates, since they were very different from our clock-determined era. But be warned: this is not a series for Roman history neophytes! You must know your history to understand and appreciate the story, characters, and the many references and asides. I enjoy these sorts of books, which is why I requested a review-copy. 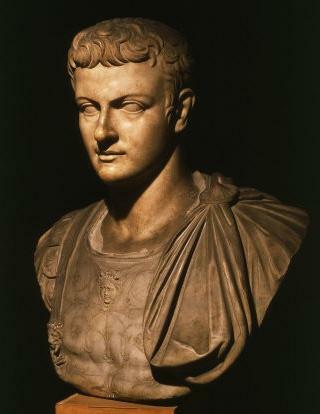 Caligula's craziness got him assassinated by his own bodyguards, for the good of Rome. 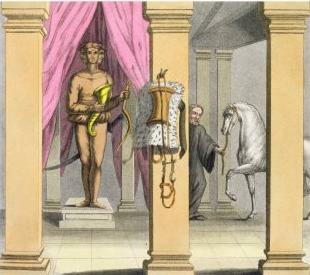 Another of Caligula's expensive whims was to house his horse in a marble and gold stable. November, AD 40. When a wealthy consul’s wife asks Corvinus to investigate the death of her uncle, killed by a block of falling masonry during renovations on his estate in the Vatican Hills, a sceptical Corvinus is inclined to agree with the general verdict of accidental death. But his investigations reveal clear evidence of foul play, as well as unearthing several skeletons among the closets of this well-to-do but highly dysfunctional family. Who could have wanted Lucius Surdinus dead? His vengeful ex-wife? His ambitious mistress? His disillusioned elder, or his estranged younger, son? Or does the key to the mystery lie in the dead man’s political past? 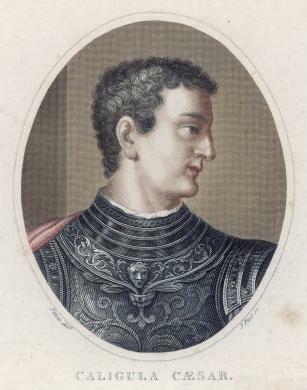 But when Corvinus’s investigations draw him to the attention of the emperor, a dangerously unpredictable Caligula, his prospects of surviving long enough to solve the mystery look slim to say the least. Finished Business is published by Severn House Publishers. These are two takes on Caligula's mental illness. The first is from a comedy Horrible Histories, the second from very serious I, Claudius. Oddly, the two play off each other well.